Students answer questions about what happens when the components in a simple battery circuit are changed. 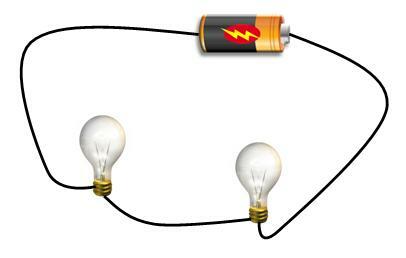 Electrical energy travels around a simple battery circuit from the battery to the device - a buzzer, bulb or motor. If the electrical energy in the circuit is too strong, it can damage the device. For example, a bulb may 'blow'. This means that the bulb will no longer work. 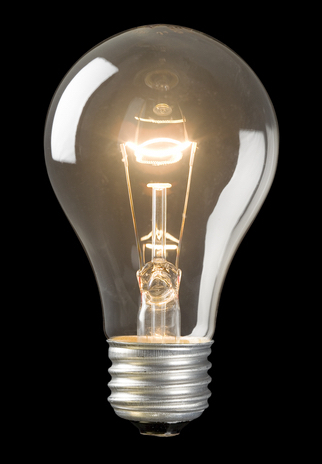 Bulbs may also glow very brightly because a lot of energy is being turned into light and heat. If the electrical energy is not enough to power the device(s) in the circuit, we will also see the effects. 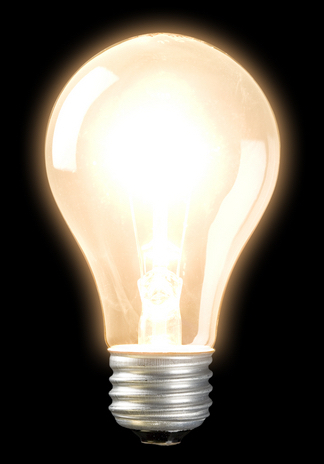 For example, bulbs may be dim, or not produce any light at all. The length of the wires in the circuit can also affect the brightness of the bulb. Very long wires make the bulb dim. Hafis and Shelly make a circuit by connecting a battery to a bulb. The bulb lights. Which one of these will make the bulb brighter? Hafis says: "If we increase the length of the wires, the bulb will be dimmer." Shelly says: "If we increase the length of the wires it will not change the brightness of the bulb." 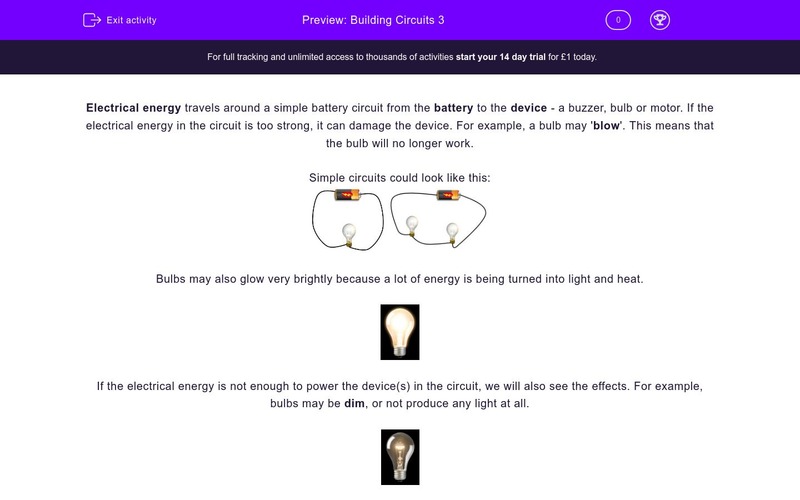 Shelly wants to add another bulb to their circuit, so that it has one battery and two bulbs. They record what they think will happen. They add the bulb to their circuit. What will happen to the brightness of the two bulbs? They change their circuit again. Shelly uses one bulb and two batteries. Which statement BEST describes the brightness of the bulb? Hafis wants to find out what will happen to the bulb if another battery is added to the circuit. Which one of these predictions is the best? Shelly and Hafis build a circuit with one bulb and one battery. The bulb glows. Shelly adds a motor to this circuit. Now the bulb does not glow and the motor does not work. Why do batteries stop supplying electricity? Shelly says: "It's much better to use rechargeable batteries because then we do not have to throw them away." What does Shelly mean by rechargeable? 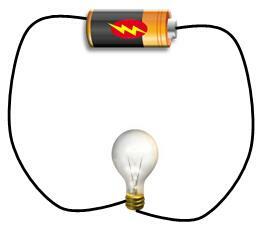 More electrical energy, provided by two batteries, will increase the brightness of the bulb. Increasing the distance the electrical energy has to travel from its source to the device reduces its power. Scientist investigate what they think will happen - they make predictions. The electrical energy from one battery is shared between two bulbs, making each one dimmer. The greater the electrical energy, the brighter the bulb. Too much electricity travelling throught the bulb will make it burn out. If there is not enough energy, the devices will not work. This explains why large kitchen appliances work on mains electricity because it is VERY POWERFUL. We MUST NEVER USE MAINS ELECTRICITY in our investigations! Today, we use batteries which can be charged-up from the mains. We do not have to throw them away. They are the GREENER alternative!